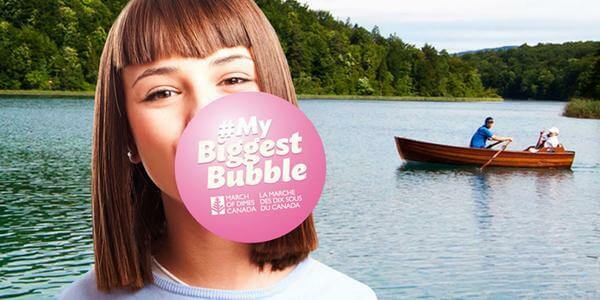 March of Dimes Canada, a community-based rehabilitation and advocacy charity for people with disabilities is asking Canadians to show off their best bubble-gum-blowing skills by taking the #MyBiggestBubble challenge and sharing their photos on Facebook, Twitter and Instagram. The new campaign starts July 11, 2015 and running until Labour Day, full contest details can be found at www.mybiggestbubble.ca. Fun Fact: Since 2011, March of Dimes has raised $20,000 through its Gumball Machine program, which sees businesses across Canada place gumball machines in their stores, restaurants, resorts and camp grounds to encourage community members to buy gumballs with all proceeds going to March of Dimes Canada. Many businesses are supporting the cause by getting and displaying gumball machine, all participating businesses are encouraged to host #MyBiggestBubble events and photo opportunities with staff and customers; a full list of events is available at www.mybiggestbubble.ca.